Storytelling is an aspect of culture that is tied into nearly every form of contemporary media. Through books, movies, TV shows and everything in between, a vast array of stories are constantly being fed into the world. However, the power of stories is not limited to merely these mediums. In a studio in Juneau, Alaska, a different method of storytelling is taking place — one that has been passed down for generations through immensely talented indigenous artists. Read more. Erin O'Hare, Cville Weekly. With an open palm, Teri Greeves gestures to a handful of small, intricately beaded Kiowa Indian cradleboards lined up inside a glass display case. The Mellon Indigenous Arts Initiative, the Kluge-Ruhe Aboriginal Art Collection, and the "Oceans of Exchange" symposium were recently featured in UVA Today. Find out "How UVA Has Become a Glocal Center for Indigenous Art." A gift given in the name of peace hundreds of years ago has found its way back home. Preservation Virginia repatriated a 17th-century frontlet back to the Pamunkey Tribe, which was originally gifted by King Charles II of England to Pamunkey Queen Cockacoeske, in a ceremony at the preservation group’s Richmond office. "The University of Virginia hosted a symposium Tuesday night (November 14, 2017) to discuss the portrayal of indigenous people in Charlottesville statues. Monumental Meanings: Indigenous Perspectives on Monuments and Memorials in Charlottesville and Beyond brought scholars and indigenous people together to discuss the ways native peoples are represented in statues." Shelley Niro: Indian Summer will be on view at You Me Gallery in Hamilton, Ontario from November 10-December 3, 2017. The exhibition features several new works and large paintings from her touring exhibition "Indian Summer." Shelley Niro recently visitied the University of Virginia as a Fellow of the Mellon Indigenous Arts Initaitive. She is the winner of the 2017 ScotiaBank Photography Award and Governor General's Award in Visual and Media Arts. You Me Gallery is open Wednesday-Sunday from 12-5pm and is located at 330 James St. North, Hamilton, Ontario, Canada. The Pocahontas Reframed Film Festival aims to foster greater awareness of and exposure to indigenous languages, cultures and societies by featuring film and live performances celebrating Native American stories and storytellers. Pocahontas Reframed: Native American Storytellers Film Festival will be held on November 17-19 at The Byrd Theater. Admission is free, but seating is limited. To register and see the full event schedule, visit pocahontasreframed.com. Henry Skerritt, Curator of Indigenous Arts of Australia at Kluge-Ruhe, was quoted in The Washington Diplomat in an article about the current exhibition of Indigenous art at the Embassy of Australia in Washington, D.C. The exhibition features works by Raymond Bulambula and his wife*, recent Mellon Indigenous Arts Visiting Fellows at UVA. *Note: Raymond Bulambula’s wife passed away several months after these events and she is referred to here as ‘his wife’ in accordance with cultural protocols that prohibit the name or image of a recently deceased person from being spoken, written or presented. Monday, October 9, 2017 is Charlottesville's first Indigenous Peoples Day. Learn about the work and career of Mohawk artist and filmmaker Shelley Niro in "Shelley Niro: The way of the subtle warrior," an article by Murray Whyte for the Toronto Star. Niro will be in residence at the University of Virginia from September 20-October 5 as a Visiting Fellow of the Mellon Indigenous Arts Initiative. On Friday, August 25, the Kluge-Ruhe Aboriginal Art Collection will hold a lecture and reception to open an exhibition titled Australia: Defending the Ocean at the Charles L. Brown Science and Engineering Library. The exhibition, which has been installed in the Library’s reading room, highlights the ecological disaster created by abandoned and discarded fishing nets off the coast of northeastern Australia. These “ghost nets” are made of strong plastic designed to withstand the harsh ocean environment. A by-product of the commercial fishing industry, ghost nets drift on the ocean currents, trapping a rich array of marine life including such endangered species as sea turtles, sharks, rays and sawfish among many others. Eventually they drift to the ocean floor, suffocating marine animals and coral reefs alike and creating long term damage to the marine environment. It is estimated that over 640,000 tons of fishing equipment is left in the oceans each year. Indigenous Australians were among the first to notice the devastating effects of ghost nets. For thousands of years, Indigenous people have retained and passed down extensive knowledge of marine life, a result of their longstanding stewardship of the environment in which they live. In reaction to the increasing threat posed by debris in the ocean, Aboriginal artists from Pormpuraaw, Queensland, have begun harvesting ghost nets and turning them into delightful sculptures of marine life. Their artworks raise awareness about the environmental threat of litter in the ocean. Also included in the exhibition are three prints and an aluminum sculpture of a stingray by Brian Robinson (Maluyliga, Wuthathi, Malaysia Dayak). The sculpture, Ocean Guardian, represents the creation story of the Great Barrier Reef and is covered in mineral, the distinctive graphic patterns of Torres Strait art. In his linocut prints, Robinson draws on his Torres Strait Islander heritage and traditional art historical and pop culture imagery. On Friday, August 25 at 4 pm professor Stephen Macko from UVA’s Department of Environmental Sciences and Kluge-Ruhe director Margo Smith will discuss the exhibition from two different perspectives. The lecture will be followed by a Final Fridays reception with refreshments concluding at 7 pm. Brown Library is located in Clark Hall, 291 McCormick Road, on UVA’s central Grounds. Australia: Defending the Ocean was first exhibited at the United Nations during The Ocean Conference in June 2017. Kluge-Ruhe wishes to thank the artists of Pormpuraaw Art and Culture Center and the exhibition organizers Stéphane Jacob of Arts d’Australie, Paris, Suzanne O’Connell of Suzanne O’Connell Gallery, Brisbane, and John Stafford of Onespace Gallery, Brisbane, who represents Brian Robinson. On Thursday, July 13, Karenne Wood, director of the Virginia Indian Program at Virginia Foundation for the Humanities, spoke with local Charlottesville radio station WINA about the Virginia Indian Tribute and her work at VFH. She also mentioned upcoming visiting fellows Shelley Niro and ElizaBeth Hill, who will be in residence at the University of Virginia this Fall. Use the link below to hear the full interview. On July 20th from 5 – 9 pm, the Kluge-Ruhe Aboriginal Art Collection of UVA will open a major new exhibition curated by five undergraduate students from diverse backgrounds that are under-represented in the curatorial profession. The students’ exhibition, titled Songs of a Secret Country, features twenty-three artworks newly donated to Kluge-Ruhe by Stephen and Agatha Luczo. This summer, Kluge-Ruhe is training the next generation of curators while addressing the pressing lack of diversity in American museums, as part of UVA’s broader Mellon Indigenous Arts Initiative. 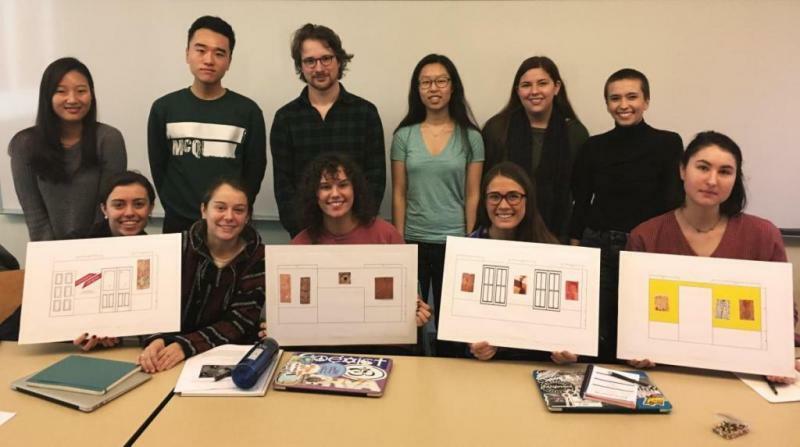 Five undergraduate students—India Ferguson, Imani Williford, Rosalba Ponce, Jake Martin, and Caitlin Keeve—have traveled to Charlottesville from their homes in California, Oklahoma, Pennsylvania and Florida to learn every aspect of designing an exhibition, from writing wall labels down to choosing wall colors. Songs of a Secret Country: The Stephen and Agatha Luczo Gift and the accompanying catalogue will be launched on Thursday, July 20 at Kluge-Ruhe’s Night at the Museum event, with each student presenting a short “flat-chat” tour of key works in the exhibition. This event will also feature live original music by local band Adar, food trucks, beer from Blue Mountain Brewery and wine from Glass House Winery. Admission is $5 for non-members and free for museum members. It is family-friendly and no reservations are needed. For more information about the museum and this event, visit kluge-ruhe.org or call 434-244-0234. The Virginia Indian Commemorative Commission and the Virginia Capitol Foundation will host the Groundbreaking Ceremony for the Virginia Indian Tribute. This monument, entitled Mantle, recognizes the lasting legacy and significance of American Indians in the Commonwealth. The featured speaker at the groundbreaking is Billy Mills, member of the Oglala Lakota (Souix) tribe and the Olympic gold medal winner of the 10,000 meter run in the 1964 Tokyo Olympics. The Groundbreaking Ceremony will take place at 10 a.m. on Saturday, June 24 in Capitol Square, located at 1000 Bank Street in Richmond, VA. The public is invited to join in the groundbreaking ceremony. To RSVP or for more information please call 804-308-2583 or email info@monumentalconsultingllc.com. Rain or shine. Indigenous artist Shelley Niro has won the seventh annual Scotiabank Photography Award. This prestigious award recognizes a Canadian photographer who has made an outstanding contribution to contemporary art and photography. In addition to the $50,000 cash prize, the award includes a solo exhibition at the 2018 Scotiabank Contact Photography Festival and a book of the artists work published by Steidl of Germany. Shelley Niro will also be visiting the University of Virginia in Fall 2017 as a Mellon Indigenous Arts Initiative artist-in-residence. On Friday March 17, 2017 Karenne Wood, director of Virginia Indian programs at Virginia Foundation for the Humanities, delivered a keynote lecture at a conference in London marking the 400th anniversary of the death of Pocahontas. The conference, Pocahontas and after: historical culture and transatlantic encounters, 1617-2017, was organized by the Institute for Historical Research at the University of London and was supported by the Omohundro Institute for Early American History and Culture, The British Library, and The University of Warwick. Her lecture, Prisoners of History: Pocahontas and American Indian Women in Cultural Context, explores two very different stories of Native American women, Pocahontas and Mary Jemison. Continue reading. Sydney Collins, a UVA alumna and former intern at the Kluge-Ruhe Aboriginal Art Collection, has joined the staff at the Virginia Museum of Fine Arts as the Mellon Conservation Photographer/Technician. In this role, she is part of the team working on the Conservation Initiative in African Art. This Conservation Initiative is funded by a grant from the Andrew W. Mellon Foundation and aims to support in-depth technical examination, conservation, and art historical studies of the museum's African art collection. Allison Bigelow, Assistant Professor of Spanish at UVA, has won two fellowships for her research on how European and indigenous empires responded to the same metallic materials in different ways. The Huntington awarded Bigelow a Barbara Thom fellowship, and the American Council of Learned Societies awarded her an ACLS Fellowship. Bigelow studies the history of colonial science and technology, primarily vernacular scientific industries like agriculture and mining. These post-doctoral fellowships will support her current book project, Cultural Touchstones: Mining, Refining, and the Languages of Empire in the Early Americas. Cultural Touchstones applies literary methods to texts that fall between history and literature, showing how indigenous and European empires understand the raw materials of scientific inquiry differently. Each chapter focuses on a different metal – gold, silver, copper, and iron – and a discursive question that emerges in the writers’ responses to them: space, translation, form, and genre. "This new attention to languages reveals when indigenous miners shaped metallurgical technologies in the colonial Americas (Barba 1640) and how their knowledges were translated out of the scientific record in Europe (Montagu 1670, Lange 1676, Hautin de Villars 1730). By tracing these mistranslations, I show how indigenous classifications like “intermediary ores” were replaced by colonial racial categories like “metales mulatos.” In this way, my work shows how the recovery of indigenous natural and technical knowledges can also shed new light on the history of racial ideologies and category-making in the early Americas." Aboriginal Australian artists are having a moment in the U.S. These women are at the forefront. Of the thousands of pre-Columbian books produced, only a handful have survived to the present day, all of which shed a bright light on the history, language, and book production methods and techniques of the Aztecs and the Maya. This class will introduce the Mesoamerican Codex both as a physical and cultural object. By discussing not only the construction, material make-up, and pigments of the codices, but also by considering broader cultural questions regarding their languages, iconography, and provenance, students can begin to understand how these books functioned within indigenous societies and how they were perceived by Europeans during the sixteenth and seventeenth centuries. Read more here. We invite you to join us for the launch of this new initiative on February 10, from 5:30-7:30 pm at Kluge-Ruhe, which will culminate on April 22 with a public presentation from the student curators of the exhibition. Curatorial Lab @ UVA is a collaboration among the McIntire Department of Art, the Department of Anthropology and the Kluge-Ruhe Aboriginal Art Collection. Curatorial Lab students design the layout for their exhibition at Kluge-Ruhe. Photo by Henry Skerritt. A conversation with Mellon Indigenous Arts curator Henry Skerritt in Contemporaneity. Curated by Stephen Gilchrist, Everywhen: The Eternal Present in Indigenous Art from Australia was held at Harvard Art Museums from February 5, 2016–September 18, 2016. The exhibition was a survey of contemporary Indigenous art from Australia, exploring the ways in which time is embedded within Indigenous artistic, social, historical, and philosophical life. The exhibition included more than seventy works drawn from public and private collections in Australia and the United States, and featured many works that have never been seen outside Australia. Everywhen is Gilchrist’s second major exhibition in the United States, following Crossing Cultures: The Owen and Wagner Collection of Contemporary Aboriginal Australian Art at the Hood Museum of Art in 2012. Conducted on April 22, 2016, this conversation considers the position of Indigenous art in the museum, and the active ways in which curators and institutions can work to “indigenize” their institutions. Gilchrist discusses the evolution of Everywhen, along with the curatorial strategies employed to change the status of object-viewer relations in the exhibition. The transcription has been edited for clarity. The city is already rich in film festivals, and Richmond will soon be adding more to its repertoire by boasting some of the best of Native American cinema . Organizers of the first American Indian Film Festival of Virginia, set for Nov. 17-19 at the Byrd Theatre, are aiming to make their inaugural event the biggest of its kind on the East Coast. They’re hoping to create a forum for telling stories of cultural affirmation, resistance and survival of Native Americans in the commonwealth and beyond.